These overview of the changes to the Annual Fire Safety Statements NSW have been supplied by Vincent Graham of Project Guides and David Bannerman and Carlo Fini of Bannermans Lawyers. Annual Fire Safety Statements are required to be submitted to your Local Council and Fire and Rescue NSW (FRNSW) each year outlining all Statutory Fire Safety Measures in the building comply with the relevant standard. This requirement is outlined in Part 9 of the Environmental Planning and Assessment Regulation (EP&A Regs) 2000. Back in July 2017, the NSW Government announced a series of building regulatory reforms, largely in respect to fire safety, which came into effect on 1 October 2017. These reforms affect the Annual Fire Safety Statement NSW process and some changes may be required. A new template for Fire Safety Statements. Previously, the requirements to undertake inspections were by a ‘properly qualified person’, which wasn’t defined, meaning the inspector didn’t need to have any qualification or be licensed. The legislation has now changed and as of the 1st October 2017, assessments and inspections must be undertaken by a ‘competent fire safety practitioner’ in lieu of ‘properly qualified person’. As with the introduction of new laws, there needs to be some time for the industry to adjust. Currently, there is only one option available for inspectors to become competent until the industry can provide suitable industry schemes (e.g. approved training courses). Until that time, it is the responsibility of the Building Owners to determine the competence of the inspectors. Identify tasks that the fire safety practitioner will need to perform. Consider the fire safety practitioner’s competence to perform those tasks, including knowledge, skills, and experience. Establish and record an opinion of the practitioner’s competence. Before considering the competence of a practitioner, owners should identify which kinds of tasks need to be performed. Assess fire safety alternate solutions – this will likely require specialist expertise to assess whether the fire safety measure can still perform to the standard expected. Once the tasks have been identified and described, the next step is for the building owner to consider the practitioner’s competence, including whether they have sufficient knowledge, skills, and experience. < strong>: Fire safety practitioners should provide adequate documentation to building owners, detailing evidence of knowledge, skills, and experience. Based on the assessment of a practitioner’s knowledge, skills, and experience, the final step is to determine whether the person is a competent fire safety practitioner for the tasks required. There is a new provision in the Regulation requiring that the building owner record in writing that in their opinion the person or persons selected are competent to perform the fire safety assessments and inspection. The main changes relating to the new Annual Fire Safety Statements template are Section 6 and Section 9, which require the details of each of the CFSP’s and the requirement for the Building Owner to sign the document, respectfully. 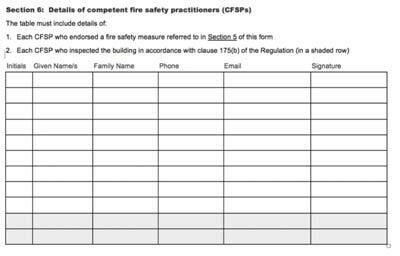 The new Annual Fire Safety Statements template now requires the details of all practitioners that inspected the building to be listed. The new AFSS template requires the Building Owner to sign the document. This means that no longer can the Strata Manager rely on the maintenance contractor to sign off on behalf of the Building Owner. Signing and issuing the AFSS’s. For assistance with your Annual Fire Safety Statements NSW and to ensure we follow the statutory requirements, please contact Project Guides. NSW: Annual Fire Safety Statements: What Are They Good For? Sometimes, Absolutely Nothing! April 2015 – Building owners will be familiar with the legal requirement to lodge a fire safety statement with the local council and fire brigade every year. This requirement is set out in the Environmental Planning & Assessment Regulation 2000 (Regulation). The process usually involves a fire services contractor attending the building, inspecting and testing fire safety measures and certifying they are compliant or recommending work to make them compliant, and once that work is complete, certifying compliance, and then the owner sends the statement to the local council and fire brigade. Our experience based on cases we have seen is that owners cannot rely on this process if they want to make sure that their building fully complies with the Building Code of Australia and any applicable Australian Standard. There is no requirement in the Regulation for the fire services contractor to have any qualification or be licensed or insured. All the Regulation requires is that a building be assessed by a “properly qualified person” but there is no guidance in the Regulation about who a “properly qualified person” is. Annual fire safety statements are certified by or on behalf of the building owner (for strata buildings, it’s usually the strata manager). The contractor is not the person certifying the statement to the local council or the fire brigade. Often, the fire services contractor is the same contractor used by the original developer of the building to install the fire safety measures and provide a certificate of self-certification for the occupation certificate. One can hardly expect such a contractor to find non-compliance in a subsequent year having initially certified the building as compliant. If the initial fire safety schedule issued at the time a new building is completed contains an error and the building is non-compliant, then unless the fire services contractor carries out a thorough inspection, may go unnoticed. The fire services contractor when doing the annual inspection usually does not have the construction certificate drawings and plans on fire safety measures that show the location and number of measures in the building. The contractor usually simply relies on the fire safety schedule which doesn’t indicate the location or number of fire safety measures such as dampers in the building. While there is an Australian Standard on how to test and maintain fire safety measures, the Regulation does not make it binding on the contractor or the owner. For buildings subject to Alternative Solutions and subsequent requirements of Alternative Solutions to be permanently listed on the fire safety schedule, they are often overlooked and misplaced soon after an occupation certificate is issued. This has the effect that requirements of Alternative Solutions are forgotten, leading to shortcomings in fire safety in the building. For a new building, if there is a fire safety defect for which the owner could sue the builder or developer for breaches of the statutory warranties in the Home Building Act 1989, but such defect is not revealed during the annual fire safety inspection (it should be), then the owner will miss out on being able to sue the builder or the developer for the defect. The owner could consider suing the fire services contractor but that is a harder legal case to prove. Owners should bear in mind that the local council can issue a fire order against a building’s owner for non-compliance even though the reason for the non compliance is due to a building defect or an omission by the fire services contractor. What owners and strata managers can do to protect themselves? Conducting a thorough fire safety audit of new buildings within two years of completion so that if the audit reveals defects, a building defect claim can be made against the builder and the developer before the two year statutory warranty period expires. Not using the contractor originally used by the developer. Only using contractors who are qualified and insured. Only using contractors who comply with the Australian Standards. Providing to the contractor the construction certificate plans and drawings on fire safety measures. Have the contractor sign the annual fire safety statement. Ensure the fire safety measures and standards of performance are identical to those in the fire safety schedule attached to the occupation certificate or any subsequent development approval or fire order. NSW: Q&A Are our fire safety inspections too frequent? 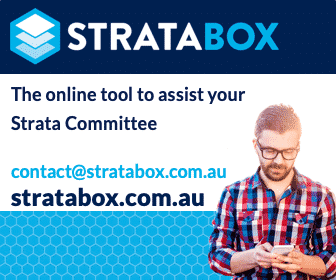 Visit our Strata Managers OR Strata Information Pages by State. Good question. Technically the Strata Manager is not the Owner and therefore shouldn’t be signing the certificate. However, I don’t know of any Council’s that would reject an AFSS based on a Strata Manager signing it. An ‘Owner’ of a strata building would be any of the many owners. If an Owner is signing off, follow the above steps and you shouldn’t have a problem. My details are below if you have further issues with this.